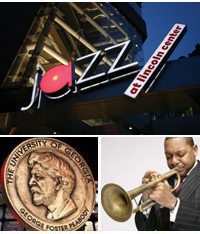 We're announcing that, as of fall 2014,Jazz at Lincoln Center Radio will make way for a new program called Jazz Night. Produced by NPR Music, WBGO, and Jazz at Lincoln Center, Jazz NIght will offer multi-platform broadcasts of exciting performances. Veteran actor (The Wire, Tremé) and New Orleans native Wendell Pierce brought the outstanding performances from Jazz at Lincoln Center's House of Swing. Each week, Pierce hosted the story of jazz through music and the players in their own words. For 22 years, Jazz at Lincoln Center Radio created its own definitive voice. We presentedthe work of musicians who have broken the mold and reworked the sound of jazz. Take a look at the program schedule from our final year of broadcast. After decades at the forefront of jazz, guitarist-composer Bill Frisell steps back to explore the roots of American songwriting. Accompanied by a trio of vocalists and multi-instrumentalists, Frisell brings the music of Gershwin, Billings, Foster, and Ives to the stage of the Allen Room. 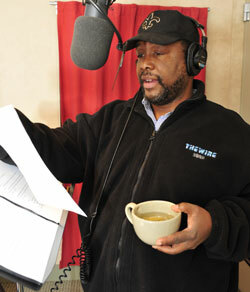 Wendell Pierce hosts. The vibrant sound of Latin jazz is rooted in the musical heritage of Dizzy Gillespie and ‘The Mambo King’ Tito Puente. Bassist Carlos Henriquez leads the Jazz at Lincoln Center Orchestra with conguero Giovanni Hidalgo and drummer Ignacio Berroa. Selections include ‘Manteca,’ ‘Ran Kan Kan,’ ‘Oye Como Va’ and more. Wendell Pierce hosts. Joe Henderson’s distinctive lyrical tenor sax could embellish bop, blues, bossa nova and his big band sound. His friends and musical collaborators celebrate the man’s lifetime of invention. We feature pianist Renee Rosnes, vibraphonist Bobby Hutcherson and Chris Potter to mark the late Joe Henderson’s birthday. Wendell Pierce hosts. Singer Dianne Reeves turns every note into an alluring story. In Jazz at Lincoln Center’s Allen Room, she’s joined by guitarist Peter Sprague, pianist Peter Martin, bassist Reuben Rogers and drummer Terreon Gully. Wendell Pierce hosts. How sweet it is when two of jazz's great minds get together! Pianist and composer Ahmad Jamal unites with JALC director Wynton Marsalis to play tunes from Jamal's rich and innovative catalogue- backed by his own quartet and the Jazz At Lincoln Center Orchestra. Wendell Pierce hosts. 8-May XXI-33 NEA Jazz Masters: Jack DeJohnette, Von Freeman, and More! The NEA Jazz Masters honors crystallize the spirit of jazz – veterans sharing the stage with keepers of the flame: stories in words and once-in-a-lifetime performances. Join us to honor these Jazz Masters: Jack DeJohnette, Von Freeman, Charlie Haden, Sheila Jordan and Jimmy Owens. Wendell Pierce hosts. The boundless creative spirit and pianist Chick Corea spins from jazz to classical to the avant garde. Musicians of the Jazz at Lincoln Center Orchestra expand the Corea songbook with their own arrangements. Chick Corea joins them on acoustic piano for Matrix, Crystal Silence and Tones for Joan’s Bones. Wendell Pierce hosts. "The trombone comes the closest to the human voice with its bent pitches, scoops, and smears, and that very human quality is evident in everything that [James Weldon] Johnson wrote," says Jazz at Lincoln Center Orchestra trombonist Chris Crenshaw. Crenshaw draws on his gospel roots to connect secular music to poetry in this sprawling suite based on the James Weldon Johnson poem. Wendell Pierce hosts. MacArthur Grant recipient and master pianist Vijay Iyer makes his debut at the House of Swing. Bassist Stephan Crump and drummer Marcus Gilmore round out Iyer's critically acclaimed trio. Wendell Pierce Hosts. ‘La Perfecta’ – pianist and composer Eddie Palmieri’s first band -- aptly describes his perfect mix of driving Afro-Cuban grooves and jazz rhythms. Palmieri takes the helm with two of his ensembles - the Eddie Palmieri Orchestra and Afro-Caribbean Jazz Octet – in this high-octane retrospective, honoring his half century of music. JALC Orchestra members Ted Nash and Victor Goines present two newly commissioned works. Nash's The Presidential Suite reflects on leadership and oratory with help from "The Wire" and "Treme" star Wendell Pierce. Goines presents "Crescent City", a musical journey through his hometown, New Orleans- joined by lifelong friend Branford Marsalis. Wendell Pierce hosts. At the age of 89, drummer Roy Haynes carries on with driving percussive force. He made his mark playing with Charlie Parker and has burnished it with Pat Metheny, the Allman Brothers, and even as a DJ on the video game Grand Theft Auto IV. Haynes leads his vibrant Fountain of Youth Band in our Rose Theater. Wendell Pierce hosts. Stevie Wonder’s colorful palette and unforgettable melodies have inspired artists of all genres and generations. The innovating, energizing SF Jazz Collective – takes on the challenge of the Wonder songbook and their own compositions. Miguel Zenon (alto), Mark Turner (tenor), Avishai Cohen (tpt), Robin Eubanks (trb), Stefon Harris (vibes), Edward Simon (piano), Matt Penman (bass), Eric Harland (drums) tackle “Mon Cherie,” “Superstition” and “Sir Duke”. Hosted by Wendell Pierce. Program or podcast ** order may change due to production needs. Check this page for most up-to-date-information. Some archive shows hosted by Wynton Marsalis or other guest hosts.